On the 1st March 2017 I was in a privileged position in north-west Mull to observe two members of one of the rarest animal communities on the whole planet! They are known as the ‘West Coast Community’ and consist of 6-8 Killer Whales that are observed year-round in UK waters. Whilst sea-watching, I got onto two very distant blows on the horizon and once I got the spotting scope on the area, I saw a huge, tall black dorsal fin breaking the surface, like the motion of a conveyor-belt. I observed two bull Orcas. I had met both of them before in Hebridean seas – Aquarius and the alpha male John Coe. Due to an increasing threat with toxins bioaccumulating through their food chain, this tiny community could very soon be yet another ecological disaster thanks to the actions of humans. On the evening of the Killer Whale encounter I was still on an “Orca High’ when good old mother nature decided to serve me a double helping! One natural spectacle, which you could say is as sought after as a wild Orca encounter, is the Northern Lights. That evening I was blessed with an auroral arc and pulsating columns before the clouds rolled in to end the showing. 2017 was even more challenging to see the Aurora Borealis. We entered a ‘Solar Minimum’, which is a recorded cycle of the sun’s ejected energy. 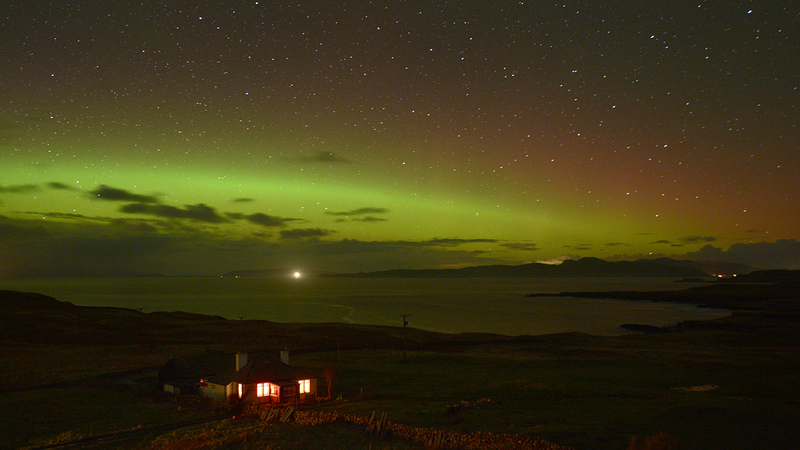 This energy is the ingredient for sparking a Northern Lights display in our atmosphere. Solar cycles have an average duration of about 11 years. Solar maximum and solar minimum refer respectively to periods of maximum and minimum sunspot counts. Cycles span from one minimum to the next with the current cycle ‘Cycle 24’ peaking in 2011 – 2014. Now in 2018 we are heading towards a time of low solar radiation. It’s not often you can say that you’re on first name terms with a wild whale, but I’m lucky to be able to know an individual Minke Whale and recognise her by appearance. 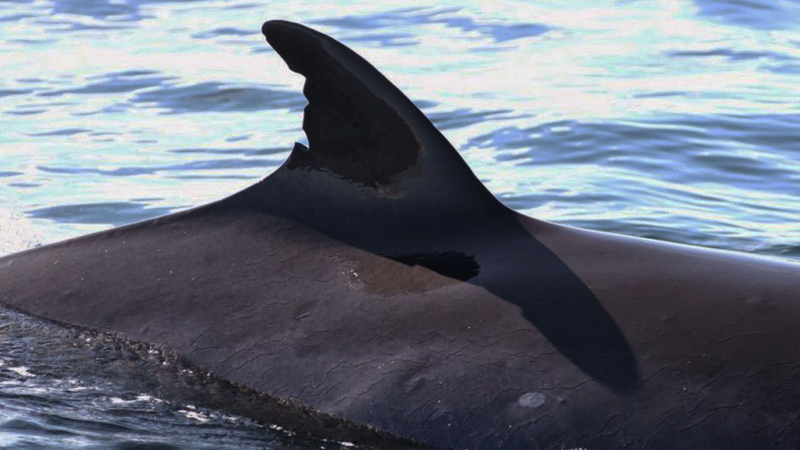 She has deep sharp cuts out of the trailing edge of her dorsal fin and is known as ‘Kasey’. We know she is a female because she has been recorded with two small calves in 2007 and 2008. Whilst crewing for a Whalewatch company on Mull over the last few years, I have experienced this animal perform strong associations with everyone aboard on a few occasions. She has a very curious nature, often circling the boat. She has even stuck her rostrum out of the water, making eye contact with individuals, including myself. On the 1st August 2017 we were aboard Sula Beag on a Whalewatch for a Nature Scotland package holiday with TV presenter Iolo Williams. Early on in the excursion we had three Minke Whales feeding around the boat. After we managed to get some photo ID shots of their dorsal fins we discovered that one of the animals was an old friend… Kasey! She was first recorded in these waters in 2000 and the last time I’d seen her was May 24th 2014. There’s one bird that comes straight out of a fairytale story, with it’s heraldic pose and golden crown. It is the overlord of the mountains and is the second fastest species in the animal kingdom. It is of course the Golden Eagle, one of the stars among the Isle of Mull wildlife. During a Nature Scotland wildlife tour in October 2017, myself and the guests witnessed a Golden Eagle performing a very bold move. The eagle was mobbing a herd of Red Deer! 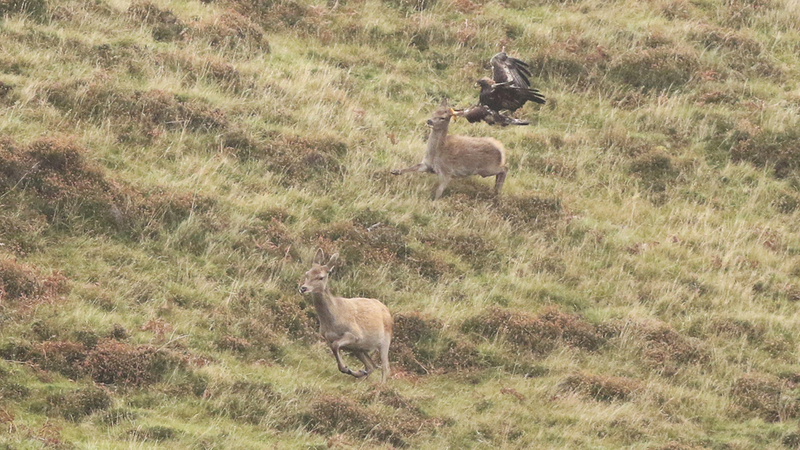 The bird was targeting a young fawn and managed to flush it from the nursery group, then amazingly attempted to grasp the mammal with it’s huge talons. This action was brilliantly captured on camera by one of our guests, Dawid Banasiak. I’ve read about this behaviour in Golden Eagle literature but feel privileged to have been in the right place to witness this eagle ecology taking place. Golden Eagles are highly opportunistic hunters. They can prey on anything from a Meadow Pipit of 15g to a new born Red Deer at 15kg. A day of sunshine and low winds in 2017 was almost as rare as the sightings above, but when they did appear, so did a very special avian animal! Their fossil records date back 300 million years and during the carboniferous period they were almost equivalent to our eagles today – the sky’s superiors, with a wingspan reaching 3 1/2 feet! I’m talking about dragonflies and on one sunny Nature Scotland ‘Ardnamurchan Tour’ we observed five species during one excursion! Golden-ringed, Common Hawker, Beautiful Damoiselle, Common Darter and Four-spotted Chaser. 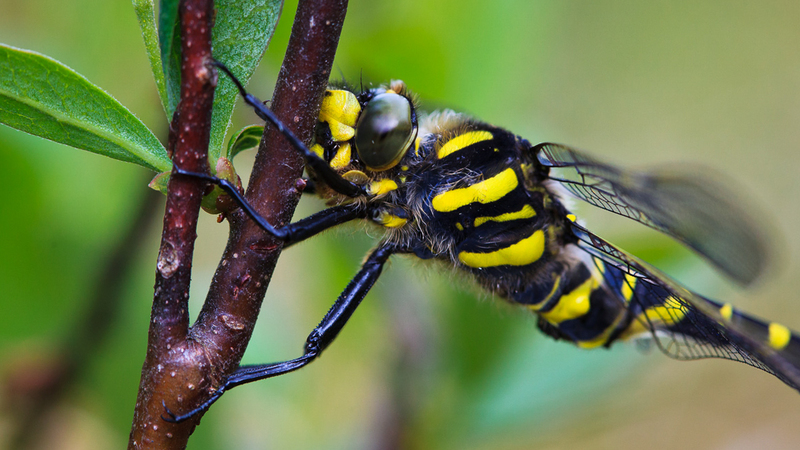 Find out more about Mull wildlife in our guide here. What was your best Mull wildlife experience?